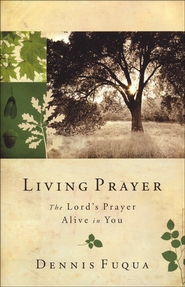 Living Prayer brings fresh insight to this ancient prayer and gives us the tools to transform our prayer lives. Book Review By Jan M.
Dennis Fuqua (pronounced few-kway), the director of International Renewal Ministries, and author of Living Prayer, challenges you to take Jesus' command on how to pray more seriously than ever before. The events in Matthew 6:9-13 and Luke 11, took place in two different times and settings, but in both Jesus told his followers, "This, then, is how you should pray," and gave them the words which we now call "The Lord's Prayer." Part 1 of this book introduces you to the prayer and explains why and how it can be helpful to your life. In Part 2, each line of the Lord's Prayer is broken down with explanation to help us have a deeper understanding of the meaning. Having learned the Lord's Prayer as a little girl, I can still recite it today. Before reading this book I would have told you that I understood the meaning... but, I'd never studied it in this way. I appreciate James Mulholland's quote which compares the prayer to making a marriage vow. Even though it only takes a few minutes to recite, it must be lived out for years in order to become meaningful. I thought Chapter 9, "Forgive us our debts," was especially well written. I often hear people who are confused about what forgiveness means. It doesn't mean to 'forgive and forget.' We can and do remember offenses, but we must choose not to retaliate. We can get mad, but not get even. If you have questions about the topic of forgiveness, I recommend this chapter. It's written in a way that is easy to understand and remember. At the end of each chapter there is a response section with a few questions to help you process what you've learned. Part 3 has, what the author calls, "training wheel prayers," to assist us until we are ready to ride on our own. There are a multitude of combinations given, to suit every need. Labels: Non Fiction- Living Prayer, Review By Jan M.
"The one thing that really made me think was the gossip that went on in the church"
A picture-perfect marriage. A little harmless flirting. Two sisters, with lifelong resentments. The ultimate betrayal. Bridgette’s life, on the sun-drenched west coast of Australia, appears perfect – married to a successful lawyer, Joel, with two beautiful daughters and a leadership position in church. She even has herself fooled into thinking she’s got it all together. But there’s a perfect storm brewing, a wave of events that will sweep away Bridgette’s superficial world forever. Joel is harboring frustrations which his self-centered wife won’t acknowledge, and Bridgette’s sister is nursing an old grudge against her. When dangerous passions erupt between the two, Bridgette is blind-sided and humiliated. As destruction falls on everyone she loves, Bridgette must finally get real with herself… and with God. In the aftermath, an attractive younger man offers her his heart, but can Bridgette build a new life and a stronger love amid the rubble? Or is it possible to forgive the unforgivable? Keren Franklin spins a gripping, cautionary tale about the tangled web we weave when first we practice to deceive… ourselves. It's not often that I read a book that has me changing my mind about who I think is wrong or right, but this one certainly did! Bridgette seemed to have the perfect life. Her husband Joel is a successful lawyer in her father's firm, she has two wonderful daughters, and attends church regularly where she leads a Bible study group. The only thing is she doesn't have a great relationship with her sister Piper, who is a single mother, although their relationship isn't great they still get along, or at least they do until Piper crosses a line and does something that can never be undone, something that puts Bridgette's perfect marriage in jeopardy, and has her rethinking her entire life. Will Bridgette's marriage be over, can she ever find forgiveness for Joel and Piper? What happens with Bridgette's relationship with God? Well this book really hooked me... the thing is I had my mind all made up about who and what was right and wrong. In the beginning I think I was alot like the character of Amy in this story, and couldn't see past the deed that had been done. As the story unfolds though I really saw that not everything is so black and white, and could see how something like the situation in this book could happen. While I really felt for Bridgette, I also felt empathy for Joel as well as Piper, although it took me a while to get there with these two characters. The one thing that really made me think was the gossip that went on in the church. That topic alone makes this book a must read. Overall, this is a thought provoking read that would be great as a group read, especially for women's church groups, because there are several lessons to be learned in the pages of this one. I am anxious to read more from this author!